The Sharp LC-80UQ17 is the largest of the UQ series and second largest in the entire Sharp lineup. The 90-inch 650 series TV is the largest Sharp has to offer this year. The TV gets Sharp's new picture technology, Quattron+. Combined that with THX certification and Revelation Technologies to give it a real edge over the SQ series that features Quattron+ as well. This TV can accept 4K signals thanks to Quattron+ making it "future-proof." Active 3D playback and a new take on Sharp's Smart Central make this one solid offering. Prices for this massive 70-inch TV begin around $5,499. A bright and colorful picture is the highlight of the picture of the Sharp 80UQ17 series of LED TVs. The new Quattron+ color technology adds more subpixels to the display for a higher level of detail. Built-in upscaling works to provide a higher level of sharpness that a traditional 1080p screen can achieve. Combine this feature with THX certification for excellent picture settings right out of the box. This model sports active 3D playback as well, with 2 pairs of glasses included in the box. We've favored all the passive 3D we saw last year, but the benefits of active 3D persist. It uses the AN-3DG40 Bluetooth 3D Glasses which are comfortable but run around $50 per pair. Front and center viewing yeild the best results. The 80UQ17U is ideal for bright room viewing. 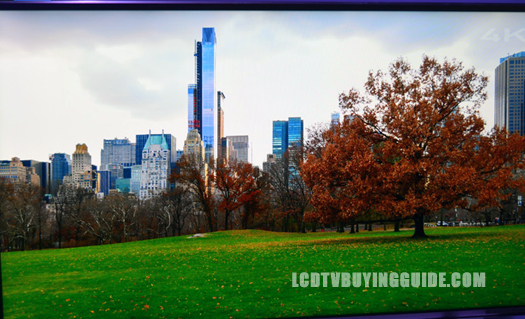 Side viewing angles for LED TVs are certainly getting better, and the LC-80UQ17 shows better performance than the lower models. Color and contrast begin to fade as the viewing point moves further from front and center. Large screens like this allow for wider fields of view, so faults need extreme viewing angles to really hurt the picture quality. 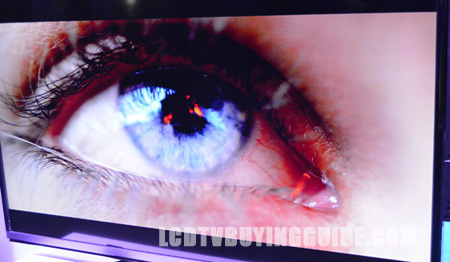 Quattron + or Q+ Aquos TVs from Sharo add 10 million more sub-pixels to the display. They call this a "4K-like" TV. The feature works by pixel splitting on vertical resolution. As a result the TV accepts 4K content even though it's a true 1080p TV. This is the only 1080p TV to display dedicated 4K content. It is much more competitive price-wise than a 4K UHD TV. Very interesting offering that Sharp is calling future-proofing. 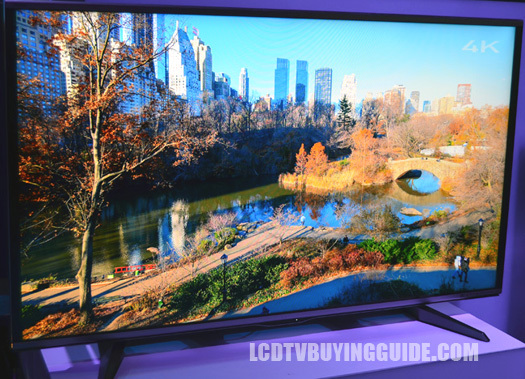 We'll see how it holds up as the price for true 4K TVs continues to drop. The Sharp LC-80UQ17U boasts an excellent refresh rate of 240Hz. The jump to 240 from 120 is not as noticeable 60 to 120, but it a welcome addition that adds a great deal of value to the TV. Fast refresh rates are ideal for live sports programming, video games, and fast action scenes of all kinds. 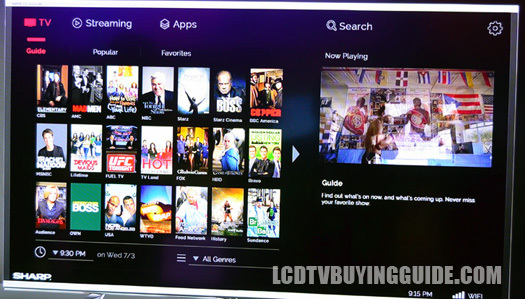 Sharp has redone their Smart Central Smart TV platform once again. They seem to be moving in the right direction, but haven't caught up to LG and Samsung. An interactive guide has been implemented that compiles information from the cable/sattelite box and streaming services for viewing available content in one place. All the standard apps are here as well. Netflix, Hulu Plus, Vudu, YouTube, Pandora, Rhapsody, and all the social media you need. The web browser features split screen viewing so you can surf the web without interrupting your favorite program. That one is a pretty big deal as not everyone is doing that yet. The appearance of the 80UQ17 series features the same thin bezels and super thin profile, but with a brushed silver color. The two legged stand is a nice touch as it doesn't take a lot of attention away from the screen itself. The stand does add a few inches of depth. Wall mounting this TV would really highlight just how thin it is. The frame is aluminum, which is a nice touch and speaks to the known reliability of Sharp's TVs. The Sharp LC-80UQ17 LED TV has plenty of high points to make it a good buy for your TV room, especially the future-proof ability to display 4K signals. Flat picture depth and shoddy sound quality are hits to the overall package, but don't take it out of the running. A retail price of $5,500 (sometimes less from online retailers) may make it hard to compete with TVs from Samsung and LG with similar feature sets (minus the 4K playback). The most redeeming quality about the UQ17 is the ability to accept and play 4K signals on a 1080p TV.